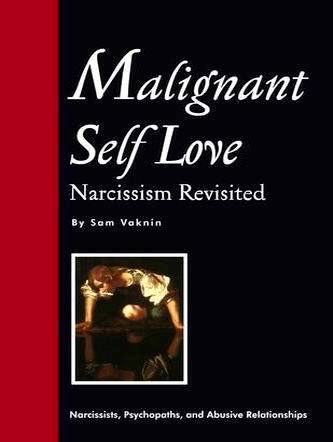 "Malignant Self Love - Narcissism Revisited"
Click Here for Information about "Malignant Self Love - Narcissism Revisited"! READ THIS: scroll down to review other FAQs - Click on the blue-colored text to access them! The contents of this website are not meant to substitute for professional help and counseling. The readers are discouraged from using it for diagnostic or therapeutic ends. The diagnosis and treatment of the Narcissistic Personality Disorder can only be done by professional specifically trained and qualified to do so  which the author is not. Hello. Recognize me? No? Well, you see me all the time. You read my books, watch me on the big screen, feast on my art, cheer at my games, use my inventions, vote me into office, follow me into battle, take notes at my lectures, laugh at my jokes, marvel at my successes, admire my appearance, listen to my stories, discuss my politics, enjoy my music, excuse my faults, envy me my blessings. No? Still doesn't ring a bell? Well, you have seen me. Of that I am positive. In fact, if there is one thing I am absolutely sure of, it is that. You have seen me. Perhaps our paths crossed more privately. Perhaps I am the one who came along and built you up when you were down, employed you when you were out of a job, showed the way when you were lost, offered confidence when you were doubting, made you laugh when you were blue, sparked your interest when you were bored, listened to you and understood, saw you for what you really are, felt your pain and found the answers, made you want to be alive. Of course you recognize me. I am your inspiration, your role model, your savior, your leader, your best friend, the one you aspire to emulate, the one whose favor makes you glow. But I can also be your worst nightmare. First I build you up because that's what you need. Your skies are blue. Then, out of the blue, I start tearing you down. You let me do it because that's what you are used to and you are dumfounded. I was wrong to take pity on you. You really are incompetent, disrespectful, untrustworthy, immoral, ignorant, inept, egotistical, constrained, disgusting. You are a social embarrassment, an unappreciative partner, an inadequate parent, a disappointment, a sexual flop, a financial liability. I tell you this to your face. I must. It is my right, because it is. I behave, at home and away, any way I want to, with total disregard for conventions, mores, or the feelings of others. It is my right, because it is. I lie to your face, without a twitch or a twitter, and there is absolutely nothing you can do about it. In fact, my lies are not lies at all. They are the truth, my truth. And you believe them, because you do, because they do not sound or feel like lies, because to do otherwise would make you question your own sanity, which you have a tendency to do anyway, because from the very beginning of our relationship you placed your trust and hopes in me, derived your energy from me, gave me power over you. Run to our friends. Go. See what that will get you. Ridicule. I am to them what I originally was to you. They believe what they see and that's what they see, and they also see the very mixed up person that you obviously have become. The more you plead for understanding, the more convinced they will be that you are crazy, the more isolated you will feel, and the harder you will try to make things right again, by accepting my criticisms and by striving to improve yourself. Could it be that you were wrong about me in the beginning? So wrong as that? Not an easy pill to swallow, is it? How do you think our friends will react if you try to cram it down their throats? After all, it really is you who have thwarted my progress, tainted my reputation, thrown me off course. There is an escape from the frustrations you cause me and, fortunately, my reputation provides enough insulation from the outside world so I can indulge in this escape with impunity. What escape? Those eruptions of anger you dread and fear, my rages. Ah, it feels so good to rage. It is the expression of and the confirmation of my power over you. Lying feels good too, for the same reason, but nothing compares to the pleasure of exploding for no material reason and venting my anger like a lunatic, all the time a spectator at my own show and seeing your helplessness, pain, fear, frustration, and dependence. Go ahead. Tell our friends about it. See if they can imagine it, let alone believe it. The more outrageous your account of what happened, the more convinced they will be that the crazy one is you. And don't expect much more from your therapist either. Surely it is easier to live my lie and see where that takes you. You might even acquire some of the behavior you find so objectionable in me. But you know what? This may come as a surprise, but I can also be my own worst nightmare. I can and I am. You see, at heart my life is nothing more than illusion-clad confusion. I have no idea why I do what I do, nor do I care to find out. In fact, the mere notion of asking the question is so repulsive to me that I employ all of my resources to repel it. I reconstruct facts, fabricate illusions, act them out, and thus create my own reality. It is a precarious state of existence indeed, so I am careful to include enough demonstrable truth in my illusions to ensure their credibility. And I am forever testing that credibility against the reactions of others. Fortunately my real attributes and accomplishments are in sufficient abundance to fuel my illusions seemingly forever. And modern society, blessed/cursed modern society, values most what I do best and thus serves as my accomplice. Even I get lost in my own illusions, swept away by their magic. So, not to worry if you still do not recognize me. I don't recognize me either. In fact, I regard myself as like everyone else, only perhaps a little better. Put another way, I end up thinking that everyone else is like me, only not quite as good. After all, that's what the universe is telling me. Ah, there's the rub. THE universe or MY universe? As long as the magic of my illusions works on me too, the distinction is immaterial. Hence my need for a fan club. And I am constantly taking fan club inventory, testing the loyalty of present members with challenges of abuse, writing off defectors with total indifference, and scouting the landscape for new recruits. Do you see my dilemma? I use people who are dependent on me to keep my illusions alive. In actuality it is I who am dependent on them. Even the rage, that orgasmic release of pain and anger, doesn't work without an audience. On some level I am aware of my illusions, but to admit that would spoil the magic. And that I couldn't bear. So I proclaim that what I do is of no consequence and no different from what others do, and thus I create an illusion about my creating illusions. So, no, I don't recognize me any better than you do. I wouldn't dare. I need the magic. For the same reason I also fail to recognize others who behave as I do. In fact, they sometimes recruit me into their fan clubs. As long as we feed off of each other, who's the worse for wear? It only confirms my illusion about my illusions: that I am no different from most other people, just a bit better. But I AM different and we both know it. Therein lies the root of my hostility. I tear you down because in reality I am envious of you BECAUSE I am different. At that haunting level where I see my illusions for what they are, the illusion that you too create illusions collapses, leaving me in a state of despair, confusion, panic, isolation, and envy. You, and others, accuse me of all sorts of horrible things. I am totally baffled, clueless. I have done nothing wrong. The injustice is too much. It only makes the confusion worse. Or is this too merely another illusion? How many others like me are there? More than you might think, and our numbers are increasing. Take twenty people off the street and you will find one whose mind ticks so much like mine that you could consider us clones. Impossible, you say. It is simply not possible for that many people  highly accomplished, respected, and visible people  to be out there replacing reality with illusions, each in the same way and for reasons they know not why. It is simply not possible for so many robots of havoc and chaos, as I describe them, to function daily midst other educated, intelligent, and experienced individuals, and pass for normal. It is simply not possible for such an aberration of human cognition and behavior to infiltrate and infect the population in such numbers, virtually undetected by the radar of mental health professionals. It is simply not possible for so much visible positive to contain so much concealed negative. It is simply not possible. But it is. That is the enlightenment of Narcissism Revisited by Sam Vaknin. Sam is himself one such clone. What distinguishes him is his uncharacteristic courage to confront, and his uncanny understanding of, that which makes us tick, himself included. Not only does Sam dare ask and then answer the question we clones avoid like the plague, he does so with relentless, laser-like precision. Read his book. Take your seat at the double-headed microscope and let Sam guide you through the dissection. Like a brain surgeon operating on himself, Sam explores and exposes the alien among us, hoping beyond hope for a resectable tumor but finding instead each and every cell teaming with the same resistant virus. The operation is long and tedious, and at times frightening and hard to believe. Read on. The parts exposed are as they are, despite what may seem hyperbolic or far fetched. Their validity might not hit home until later, when coupled with memories of past events and experiences. I am, as I said, my own worst nightmare. True, the world is replete with my contributions, and I am lots of fun to be around. And true, most contributions like mine are not the result of troubled souls. But many more than you might want to believe are. And if by chance you get caught in my web, I can make your life a living hell. But remember this. I am in that web too. The difference between you and me is that you can get out.